Wonder by Carrie Bloomston is a bright collection inspired by summery playful imagery. Wonder is full of textures including stacked triangles bias strips and zig zags to help you add a bit of je ne sais quoi to all of your sewing projects and quilts. 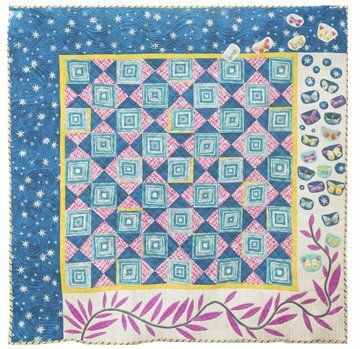 This order includes a kit which will make a 64" x 64" quilt top including lots of fun applique. Designed by Tia Curtis using Carrie Bloomston's Wonder fabric it communicates enormous joy whimsy and love.